You won't find a more iconic figure in the Australian Dance industry than that of the illustrious Lucinda Dunn. Dunn is an enduring emblem of classical dance not just for possessing the conventional qualities of grace and elegance ballet dancers exemplify, but also showcasing the remarkable strength and power that female dancers require. As someone who herself confesses to "work better when I'm absolutely exhausted", it's no wonder that three decades after she first emerged on the Australian dance scene, she's still making waves. Dunn's journey began somewhat tenuously; after the incredible achievement of winning a coveted Prix de Lausanne scholarship to attend The Royal Ballet School at the age of fifteen, her future success (which must have seemed inevitable to those around her) was jeopardised by a spinal stress fracture that left her whole upper body immobilised in a plaster cast for three months. Dunn was a resilient force from the outset though, and rather than get dispirited, she bore the sentence with focused stoicism, and after recovering went on to advance in leaps and bounds and garner herself a place at the Australian Ballet Company at the age of only seventeen. Her career accelerated rapidly from here, in 1992 she was promoted to Coryphée; in 1993 to Soloist, then Senior Artist in 1995, and in 2002 she was announced as a Principal Artist with the company. The combined grace and formidable stamina that she was known both on and off the stage for is what saw the sydney-born artist become a favourite for both critics and audiences alike over the next decade, and enabled her to continue to command the stage after the birth of two daughters (Claudia and Ava) and proceed - much to the collective delight of audiences and the company - to become the longest serving ballerina in the Australian Ballet's history, remaining there for twenty three years. After retiring from the stage in 2014 Lucinda turned her attention to the classroom; accepting a position as artistic director of both the Tanya Pearson Classical Coaching Academy, and the Sydney City Youth Ballet where she has fast become a source of constant inspiration and guidance to the next generation of talented young dancers. And for the thousands of us who have admired Lucinda at every stage in her career, it's a joy to watch her legacy resounding not just as a performer, but in the foot steps of every dancer whose journey onto the world's stage has been guided by Australia's most esteemed ballerina. E: How did you get introduced to dancing, and how old were you? LD: I began dancing at the age of 4, tap then jazz and ballet to follow. My mum was in the West End of London, musical theatre, and entertaining on cruise ships. My dad, a carpenter and Stage director. E: You’ve previously said that growing up, your ambition was to follow your mother into musicals, rather than ballet. What was it that altered your path? LD: Yes, I was a good all round dancer growing up, and thought I could follow like my mum. Just quietly though, I don’t have a good singing voice!! And do you remember a particular moment where you realised that you wanted to do ballet professionally? I do remember being very injured during my time at the Royal Ballet School, London. In plaster from my arm pits to hip bones, with a stress fracture in my spine, and couldn’t dance a step, and thinking ballet is what I would like to pursue! E: You had a phenomenal career with the Australian Ballet – retiring after 23 years. How did you stay motivated and passionate throughout that time with something as physically and mentally taxing as ballet? LD: I think it’s important to share that I wasn’t ALWAYS motivated. In fact many tired days, uninspiring seasons and frustrations with ones body!!! There was a struggle, and that made the favourable times a time for being grateful. I suppose I luckily enjoyed the pursuit of technique and daily ballet class. There were also some wonderful coaches and partners, and International tours. E: What have been some of your favourite moments as a dancer? LD: Receiving an OAM for my services to dance in 2014. Retiring in 2014 after dancing Manon. Many Performances with a wonderful dancer and partner, Robert Curran in which we shared the stage for nearly 10 years. Some beautiful quiet moments in the studio with wonderful ballet coaches, and partners. E: You will always be a permanent icon of Australian Ballet; Has it been challenging adjusting to life off-stage though? LD: I feel very fortunate that I chose to retire, and wasn’t forced off due to a director’s preference or injury. I felt a sense of accomplishment and relief actually, to have my farewell performances and what I was scheduled to dance. I knew before I retired that I was taking up directorship of Tanya Pearson’s Classical Coaching Academy, so I wasn’t walking around in a lost way, having stepped of stage. Plus I was able to give my daughters more time, in the transitional stage from ballerina to director. E: Speaking of time! The work-life balance is one area that dancers often struggle to achieve, what strategies helped you to maintain that balance, especially with two young children? LD: The moment I was home I was mummy. I had help with my children in the day, and luckily they weren’t in child care from a really young age. I didn’t, and still don’t have much time to myself, but I have a wonderful husband and father to my children. E: You’ve been the Artistic Director of Tanya Pearson Classical Coaching Academy for three years now (the same academy you danced at when you were 13!) 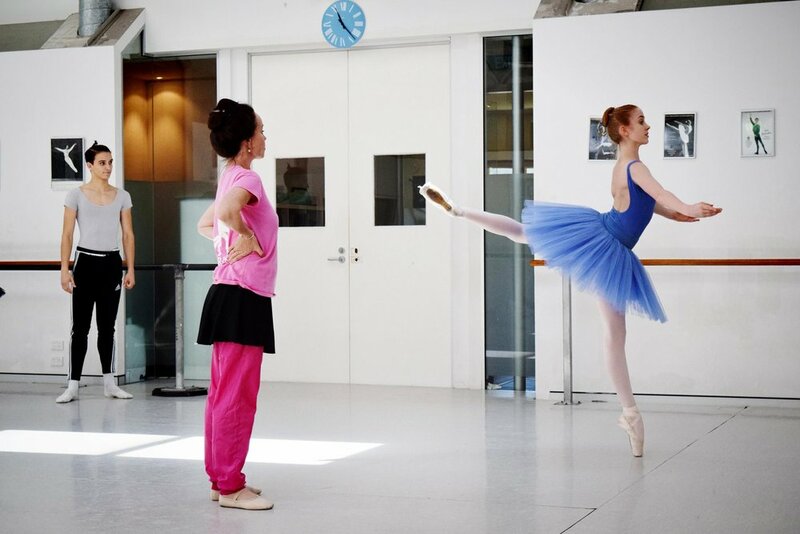 and Sydney City Youth Ballet, as well as teaching, what have been the most rewarding aspects of these new roles? LD: My biggest aim is to help get employment for these aspiring dancers. I’m passionate about all our Australian Ballet companies and have already guided a few straight into contracts. Also the Sydney City Youth Ballet’s annual Nutcracker. Seeing this ballet grow with every year I direct it. E: We were lucky enough to watch Maeve Nolan perform at the Genée Awards, and get to know what a lovely person (as well as a lovely dancer) she is! She spoke of how much you inspire her and all the students at Tanya Pearson every single day, and clearly that’s had a fantastic result for her - What was it like training Maeve? LD: Maeve is a humble, hard working, dedicated young dancer. A listener and very perceptive. Great tools to have as a dancer. Maeve would go beyond her studio hours to self improve and develop herself. E: What was it like putting those pointe shoes on again for the first time since your retirement at Victorian Dance Festival? - You looked right at home! LD: When one is in shape and in physical peak we often take it for granted. So to put my pointe shoes back on was in one way so familiar, but also because this is not daily practise, I must admit to cramping! Lucinda putting on her pointe shoes just before dancers broke the World Record for the greatest number of ballet dancers on pointe consecutively at VDF 2017. E: Dance seems to be heading in an increasingly more athletic and technique-driven direction, is there any advice you would offer to students and teachers in terms of where the emphasis of dance should lie? LD: There’s no lying that Classical ballet is an aesthetic art form, and our physical shape is not only our tool, but can be the make or break for opportunities, for students and professionals. I’m seeing that in this role too, in ballet competitions and wanting to be accepted into Internationally top end ballet schools, or seeking employment. If you are not in shape, opportunities may evade you. On top of this physicality, the performance essence and dance quality needs to be coached by teachers, guided and be allowed to develop and be explored. So it isn’t just many pirouettes with bad technique, and tricks. Finesse and purity at the end of the day for me is what ballet deserves. E: What are some of most valuable things you’ve learned over the course of your career? LD: Be self-motivated, inspired, and don’t wait to be told to practice. If a studio is free, practice by yourself; work out what works and why, and sometimes why things don’t work. Sometimes there isn’t enough time during classes to put in the repetition needed. Repetition was what made me less nervous at the end of the day. When it comes down to it, if you are on stage doing a solo in a spotlight, it’s your body and your technique that will be there for you, if it’s had the right information. E: Thanks for your time Lucinda, and for continuing to inspire and share your teaching skills with the next generation of Australian dancers. They couldn’t be in better hands.